Ben Revere dosen't carry the superstar tag like Josh Hamilton or Curtis Granderson, but it would be a major mistake to discount what he brings to the Phillies. Revere, 24, is a suburb defensive outfielder that knows how to hit. He has plus-speed and brings baseball-type smarts to a club that committed far too many mental gaffes last season. "We like athletic players, and he's certainly that," general manager Ruben Amaro Jr. said by phone on Friday. "He has great energy and he's a fantastic defender, those are priorities for us." Revere collected 150 hits last season in Minnesota, ranking second on the club behind Joe Mauer. His biggest knock is a lack of power. He has zero home runs and 33 extra-base hits in 1,064 major league plate appearances. "We got him for our defense, but he can hit too," Amaro said. "We can put him at the top of the lineup or the bottom, he can fit in either place." Revere played all three outfield positions last season in Minnesota, fielding 282 chances without making an error. His lone drawback in the field is arm strength. "He won't nail too many people at the plate, put it that way," said one Twins executive. "He will, however, make some plays that you will not believe in the outfield. He's just that good." 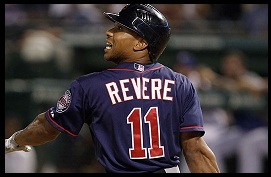 Drafted by the Twins in the first-round of the 2007 amateur draft, Revere often draws comparisons to Michael Bourn and Juan Pierre. "Bourn has a bit more pop in his bat and is more of a consistent hitter, but Ben has decent upside," Amaro said. "Defensively, the two are extremely similar." To acquire Revere the Phillies sent starting pitcher Vance Worley and top-pitching prospect Trevor May to Minnesota. "We gave up a lot, but we dealt from our strength right now which is pitching," Amaro said. Worley, 25, spent the past two seasons at the back end of the Phillies' rotation and pitched well, finishing 17-12 with a 3.60 ERA over 22 starts. It appeared, however, that durability was an issue with the right-hander and that hitters became wise to how he pitched - opponents hit .237 off him in 2011 compared to .296 in 2012. May entered last season as the Phillies premier pitching prospect but struggled in his first season at double-A Reading, finishing 10-13 with a 4.87 ERA. His strikeout ratio also dropped from 12.4 per nine innings in 2011 to 9.1 in 2012. With Revere the Phillies have an outfielder under team control until at least 2018. The move also allows for financial flexibility as the team explores ways to address holes at third base, the bullpen and now at the back end of the starting rotation. "No doubt, this trade gives us the opportunity to do some different things that we may not necessarily have been able to do otherwise," Amaro said. The trade may not have been the move everyone expected, but it certainly shouldn't be written off as uncalculated or foolish. - Patrick Gordon is the managing editor of the Philadelphia Baseball Review. Follow him on Twitter @Philabaseball or e-mail him at pgordon@philadelphiabaseballreview.com.